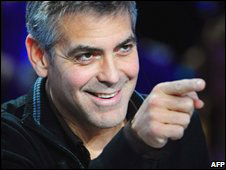 George Clooney: Scared of commitment? A man's reluctance to marry may be down to a genetic 'flaw', say researchers. Men who inherit a genetic variant that affects an important attachment hormone are prone to marital strife and are less likely to wed, work suggests. Animal studies have shown the same hormone - vasopressin - affects voles' abilities to remain monogamous. The research by the Swedish team from the Karolinska Institute is published in Proceedings of the National Academy of Science. The researchers examined the DNA of 552 sets of twins, all of whom were in a long-term relationship and had children. Some were living with their partner and others were married. The men and women were asked a series of questions about their relationship and the answers were then compared to their genetic make-up. Men with the 334 version of the AVPR1A gene earned lower scores from their partner/wife for strength of relationship bond. They were also less likely to be married. If they were married, they were more likely to have experienced marital problems. Having two copies of 334 doubled the chances that men would report having had a marital crisis in the past year. It is thought that the gene, which was carried by 40% of the men, may affect the way the brain uses vasopressin. The same gene has been linked with autism - a condition characterised by problems with social interaction. Lead researcher Hasse Walum said: "This is the first time that a specific gene variant has been associated with how men bond to their partners. "Women married to men who carry one or two copies of allele 334 were, on average, less satisfied with their relationship than women married to men who didn't carry this allele." However, he stressed the gene was only a small part of the process - there are many different ingredients to a happy marriage. "There are, of course, many reasons why a person might have relationship problems," he said. Dr George Fieldman, principal lecturer in psychology at Buckingham New University, said there could be evolutionary benefits to possessing the 334 variant. "There is potentially an advantage if the objective is to survive and spread your genes. "But there are advantages of being monogamous and having the support of a family. It's never a one way street. Like many things in nature there is a trade off and genes tend to favour their own transmission." Paula Hall, a counsellor for Relate, said: "Whilst this gene might create a predisposition, we are not slaves to our genes. The bond comes from the individuals in the relationship and the quality of their relationship."